Every once in a while you've got to make something with your children. Whether it's an awesome sandcastle, a camp at home, or something more permanent, it's fundamental to their development. At our house, we're cardboard experts. There isn't much that we couldn't build out of spare supermarket cardboard boxes, given a couple of weeks and suitable inspiration. So, when Viking Day came around at the infant school, inspiration struck. 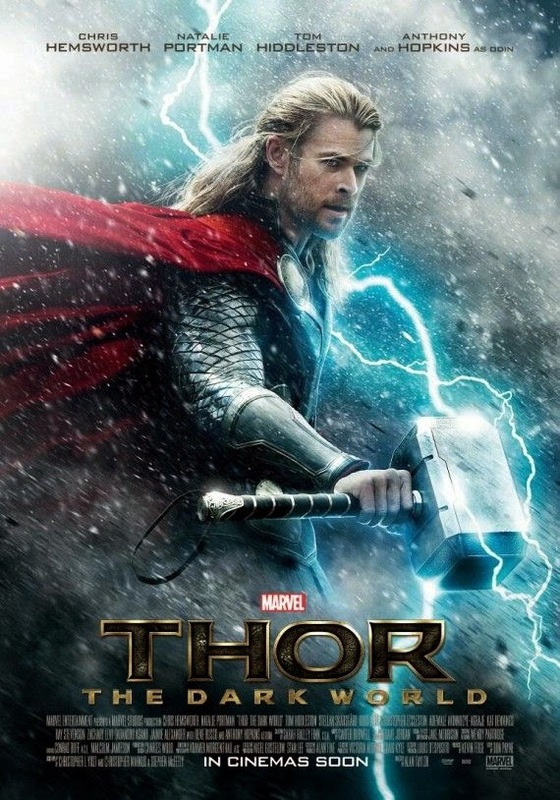 For those who don't know, Thor has a magical hammer, that only he can pick up. He and his hammer then proceed to save the world from Malekith and his army of Dark Elves. The hammer is pretty special! Viking day at the infant school involves dressing up as a Viking and coming into school for some Viking-themes activities. There is generally a rule about dressing up for school... NO WEAPONS! But this is a Hammer right? It's a tool not a weapon. We proceeded to make a Viking cloak out of an old pair of suedette curtain that were in the loft. The best design I'd seen for a Viking-ish cloak was from Game of Thrones. And a useful little instructable for that here. Now, a word about cardboard... it's not very strong! So when making anything that requires structural integrity, you have to understand the forces likely to be imparted on the creation. 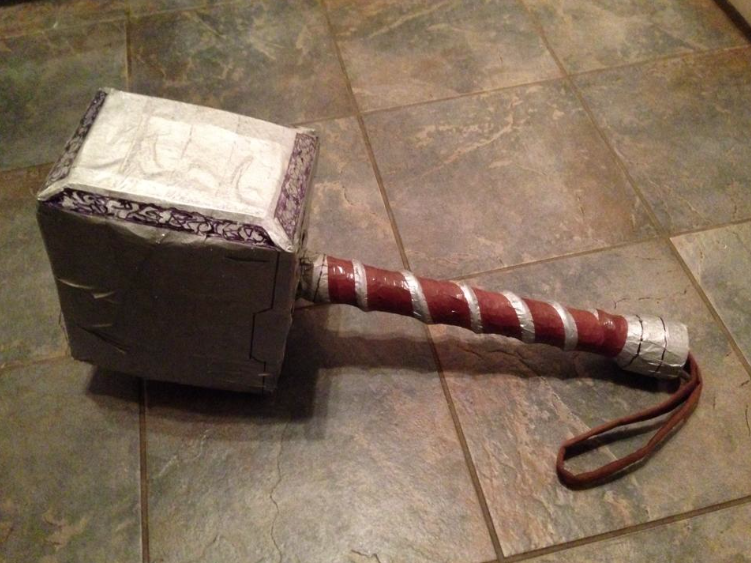 Thor's hammer looks like a hammer, feels like a hammer, and in the hands of an 8 year old, becomes a hammer. 1. The hammer would have to have a strong stem/handle. 2. The head of the hammer couldn't be too solid, in case it connected (accidentally) with another child! 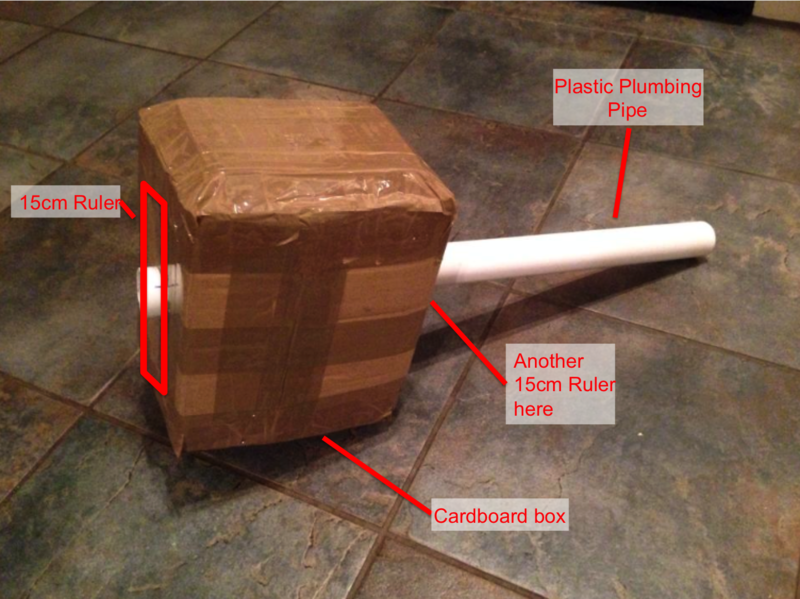 Over the course of one evening the hammer's structure was developed, using a cardboard box, a length of plastic plumbing pipe and two 15cm rulers. As with most of our cardboard projects, the brown parcel tape allows us to secure everything immediately - much better than glueing. Slots were cut into the plastic pipe into which the 15cm rulers were slid. It was a tight fit, and when parcel taped to the box, provided excellent 'torsional' strength. The basic rectangular cardboard box was built up on both end with 4 additional layers of cardboard in gradually smaller sizes. 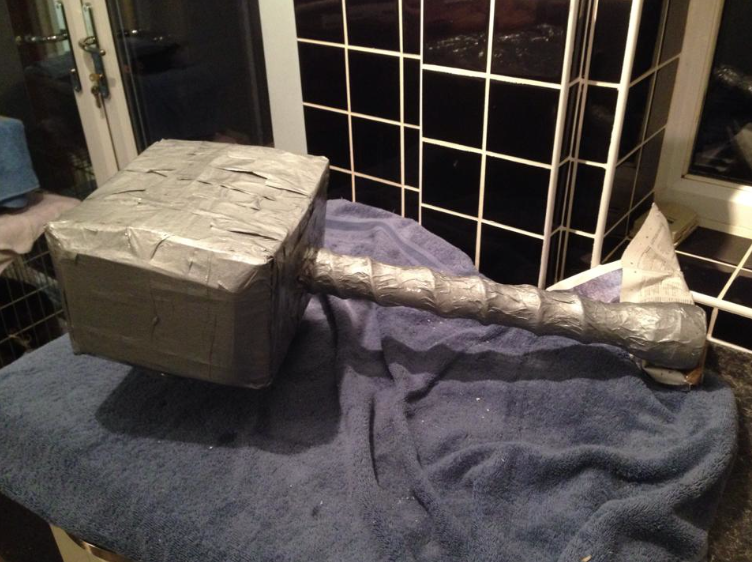 With the parcel tape stretched tight over the corners, the hammer head takes on the bevelled shape of Thor's hammer. But it still takes some imagination to see the likeness! The next stage was to add a cap to the end of the handle, to give that a feeling of substance. The top of a nearly-empty plastic Bovril jar was used. The remaining Bovril was put on toast as a mid-build snack :-). And to give the handle more texture, a length of CAT5 (thick) cable was wrapped around the plastic tube. The last step in construction was to add the 'Leather Strap' which Thor uses to swing the Hammer and activate more powerful magic! I used off-cuts from the Viking cloak curtain fabric cut into long strips, and secured them through more slots cut into the plastic pipe. I was particularly pleased with the size and feel of the handle with these additions. The hammer was ready for decoration. Paper mache has been our go-to covering for most of our cardboard projects. It nicely covers the brown parcel tape, fits into all the nooks and crannies, and is great fun for the kids to help with. Our mache recipe is warm water with a good slug of PVA glue. We've tried with flour, but the adhesive properties when dry mean PVA gets our approval. When covered in paper mache, the final form begins to appear. 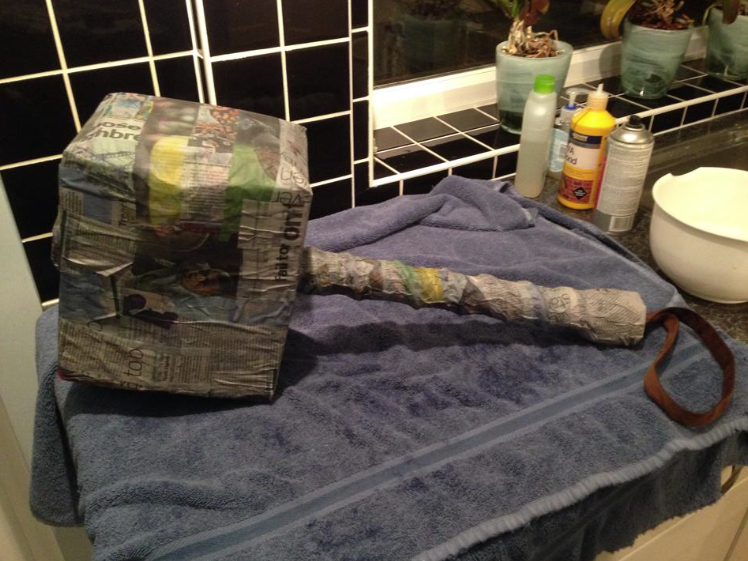 With the obligatory two layers of paper all over, the hammer took a full day to dry, so plan ahead! When wet with paper mache, the cardboard tends to go a little soft, so its important to lean the model in a way that doesn't dent of deform the shape until it dries. It's also good to rotate it, for even drying, every few hours. Once dry the hammer was ready for painting. Our paint of choice here was a metallic spray paint in silver. We used Hammerite crinkle paint to try to achieve a 'hammered steel' look, but on the newspaper, which was rough anyway, it just provided a nice dull sheen, as the base for further decoration. The Hammerite paint is also quite durable and flexible (to cope with metal heat expansion), which makes it ideal for a hammer that would be knocked around! The hammer was beginning to take shape, and we could start to see how the finished article would look. But now we needed to make it as realistic as possible. The next steps were using brown electrical tape on the handle, in the gaps between the ridges made by the CAT5 cable under the paper mache. This left a really good visual effect on the handle - I was particularly proud of this part! NOTE: You'll see an old towel protecting the kitchen work surface. This towel now has a good amount of Hammerite paint on it - as a permanent reminder of the project. And it was donated to Bentley, our Spaniel as a dog towel. Try not to leave permanent spots of paint or glue around your kitchen, those are not the kind of iritating memories we're trying to create! Old towels are perfect underneath paper mache projects, as they absorb the inevitable drips. The Head of the Hammer was decorated in a Viking pattern with a Sharpie permanent marker. And with the metallic paint looking great already, there wasn't much more finishing required. 8 Year old was delighted with the outcome, and wore his costume with more pride and sense of achievement than had we gone to a toy shop and bought something similar. Being involved in every stage of the project, he and the other kids really got to learn about how to produce something from basic materials, how to construct, decorate and finish with detail. Because we did this during the week long mid-term break, we were in a very Vikingy mood all week. So at the end of the week we had a Viking Feast at home with some friends. Keeping it as authentic as possible, we ate by candle-light, using only knives and hands. The menu included a whole roast chicken, roast rack of lamb, roast pork rib, fried mushrooms, boiled eggs, ham, chunky bread, root vegetables and ginger beer. This topped off a great week of syllabus enriching Viking learning. We're going to struggle to improve on that when the topic changes next term. But with a little ingenuity, inspriation and effort, we'll have a great time - whether it's Egyptians, Victorians or any other period of history!! !